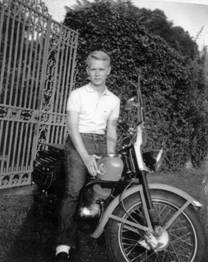 It has been 49 years since, at 16 years of age, I traveled to the Pacific coast on a Harley-Davidson 165. I acquired the motorcycle when I was 15 years old but had to wait until I could get my Virginia license before operating it on the street. In fact, my license was a restricted permit that only allowed me to operate a motorcycle. After getting my permit I rode the motorcycle to school year round. The first “trip” I remember was 42 miles to Greensboro, NC to my aunt’s home. It was a big trip for me because it was down and back in the same day. The trip was approximately 90 miles in one day. Although I do not remember the dates I do remember a trip to Richmond that occurred close to August of 1959 to the motorcycle race at the old dirt track and the fairgrounds. I was the youngest member of the Seminole Motorcycle Club. The club each year rode to Richmond to the race. While today we ride 200 or 300 miles on a Sunday afternoon, back then a trip to Richmond was a major event, even for the riders of the big “74” Harleys. Because of the maximum speed, and the inability of my bike to climb hills without losing speed, I would leave ahead of the group only to have them catch up with me in route. We left Danville on the day before the race. While the group stayed at a motel I stayed at my grandmother’s home. After the race the next day we left the track in the late afternoon and rode home. We stopped in Burkeville for supper and then rode most of the way home in the rain. Each afternoon after school I would ride to the local Harley-Davidson shop. This shop was run by Ed Guill, a retired motorcycle racer. Ed had raced in lots of small races and several major races up and down the east coast until having a major accident at the race in Langhorne, PA where he broke his hip. Although Ed had lost one eye when he was seven years old, he was good enough that in the late 1940’s or early 1950’s he raced in a Daytona Beach race when the race was still run on the beach. He made a good showing but I do not remember where he placed. What made this race interesting is he and his wife Dot rode the motorcycle that he raced from Danville to Daytona, where he raced the bike, and then rode it back home. When I first met Ed he had been running Ed Guill Motorcycle Sales and Service for about 15 years. This shop was in the backyard of his boyhood home. He had started with English bikes and took on the Harley dealership when the Danville dealer gave it up in the early 1950’s. I was very taken with Ed as it seemed to me that he could do most anything. He had restored a 1936 Harley to better then factory condition, he fixed and painted wrecked bikes to new condition; all while he re-bricked the outside of his home with brick that came from the old Burton Hotel in Danville. Each brick was cleaned and laid without help. While bricking the house he dug though the foundation and under the house to add a complete basement. I think it is interesting that in the early 1970’s Harley-Davidson began to push the dealers to expand their shops. At that time Ed could only get a limited number of big Harleys if he agreed to take small bikes, and even a scooter that Harley tried to sell named a “Topper”. I can remember the Harley-Davison representative pushing Ed to expand his shop that was only about 30 x 50 feet. Each year Ed would tell them he could not get enough new bikes to sell that would justify his expanding. One day the representative walked in and told Ed that he would have to expand or lose the dealership. Ed told the representative, who was a close family friend, to leave and take the dealership with him. After that, until Ed’s health caused him to close the shop, he seemed to do just as well selling used bikes and doing repairs. One reason for Ed’s success was in the later years he paid cash for all of the bikes he purchased used, and from Harley-Davidson, and financed all the bikes he sold with his own money. I met many interesting “characters” while hanging around the shop. One man and his wife, whose names I have forgotten, stopped by the shop each year in a truck that they lived in. He traveled to all of the early NASCAR races where she took orders and hand made driving suits for the NASCAR drivers. That was at a time many drivers drove in white tee-shirts. Although I never met him Joe Weatherly, who had raced motorcycles with Ed, was a guest in the home when racing in the area. Lynnwood Harvey was a frequent visitor around the shop. The first time I saw Lynnwood, he was riding a Harley “74”. I don’t remember all the bikes he had but he seemed to have lots of money for motorcycles and new cars for an electrician that worked second shift in Dan River Mills. In 1960 Lynnwood sold his big Harley and purchased a 1960 Harley Davidson “Super Ten”. He said all he needed was something to ride to work. The “Super Ten” was an upgrade to the 1957 Harley-Davison “165” I had. The big difference was that the “Super Ten” had a Tillotson carburetor, magneto ignition and magneto lights without a battery. Meeting Lynnwood was my first experience meeting a Pentecostal Holiness church member. Strange to me was the church requirement of plain dress and no makeup for the women. This did not seem to be in effect when they went on a trip out of town with the motorcycle club. In later years when I was dating Lynnwood’s daughter I can remember the thrill of driving his new Thunderbird to the service station on Sunday afternoon to purchase gasoline. Seems that the church would not allow him to purchase gasoline on Sunday but it was OK for me to go to hell. Sometime in 1959 we sat on the benches in the shop playing “Scratch”. Scratch was popular and played each day at the shop. With soft drinks at only a dime I could even afford to play using the money I earned cutting grass Each person wrote a number from one to ten on a piece of paper. On a grid of numbers from one to ten each person “scratched” out any number but the number he had written down. If your number was “scratched” you were out with each person remaining “scratched” until one person remained who then paid for the drinks. At some point discussion turned to the trip that Ed and Norman Boswell had made to the west coast in 1958 with Ed on a Harley-Davidson and Norman on a BSA. They had ridden through the central states to California and back by the southern states. Ed stated that he would like to make another trip to get the northern states. Lynwood expressed interest in making the trip and said he wished he had not gotten rid of his big Harley. Ed said he thought it would be fun to go on the small “165s”. His idea was at a slower speed more could be seen as he said “you rode in the same spot longer.” At some point the idea of me going with them came up. I was sure that this great idea would die with discussion at home, but to my surprise I was allowed to go. We each planned for the trip by getting together enough clothes; a heavy jacket, a rain suit, a sleeping bag and a three man tent. Ed carried the tent and Lynnwood carried the poles. It was decided we would leave after the annual motorcycle race. The Seminole Motorcycle Club sponsored a race each year called a “scramble.” This race was run on land that Ed owned outside of Danville. The land had belonged to the motorcycle club that preceded the Seminole Club. That club had borrowed money for the land to build a club house, but did not make the payments. Ed then purchased the land. On June 26, 1960, we left for the west coast. The only plan was to cover all the states in the North West and to be gone three weeks. Lynnwood had only three weeks off from Dan River Mills. Twenty-one days, 22 states and 7,968 miles later we were back in Danville. The little “165” Harleys we were riding were 6 horsepower and had two-cycle motors. At each gasoline fill up we mixed 8 oz. of outboard motor oil with 1½ gallons of gasoline. Each bike had a three speed transmission and only had suspension in the front forks. As for the back suspension, today it is known as a hard-tail suspension. Each bike had a top speed of about 60 mph on level ground with no head wind. The early “165” I was riding had the old style slide carburetor and, although it had more pulling power on hills, it got 75 miles per gallon. The newer “Super Tens” got about 100 miles per gallon but did not have as much power on hills. My, how times have changed. I used 101.9 gallons of gasoline and only paid $27.90 for gasoline for the entire trip. That’s a little over 27 cents per gallon. I remember in Yellowstone National Park where gasoline was 39 cents a gallon and we waited until we were outside the park to buy “cheaper” gas. Waiting to purchase cheaper gasoline was a gamble as the gas tank on each bike only held 1¾ gallons. With no gasoline gauge you rode using 1½ gallons, until the motor missed and then you reached under the gas tank and turned on a ¼ gallon reserve. With the main tank I could ride about 100 miles and on reserve I could go another 20 miles or so. When I left on the trip I had $125.00 in cash and no credit card. We planned to camp out each night. With the original plan we would eat a breakfast of cereal in camp each morning before starting out. We did this only the first morning, after which we would stop after our first tank of gas, or after riding about 100 miles and eat breakfast. We would eat again at about 6:00pm after which we started looking for a place to camp for the night. As I remember back then you could purchase the breakfast special which was usually eggs, bacon, toast and coffee for about 85 cents. Supper was usually the special at about $1.00 – $1.25. Out west the special was “Chicken Fried Steak” at a lot of the restaurants. I remember eating breakfast in Prairie du Chien, Wisconsin. We had ordered our usual breakfast special. The menu stated at the bottom that no substitutes were allowed. Ed, who was very “tight” with his money, had ordered milk in place of the coffee that came with the special. When we went to pay the check Ed’s total was a dime more then ours. Ed complained that coffee was a dime and milk was a dime so he should not have to pay the dime extra. After the waitress explained that no substitutes were allowed we took off our coats and sat back down while Ed drank the coffee that he said he had not ordered but had paid for. One other time we were in Denver on a cold, rainy day where we stopped at a drive-in restaurant. Ed ordered soup. When we were presented with the check he had the waitress follow him outside to read the outside menu where the soup was listed at a dime cheaper. We left the morning of June 26, 1960. As I remember it was a foggy morning and, as we pulled out of Ed’s driveway, Dot was standing on the porch crying. She was left at home with Eddie Lee their son and Ed’s sickly mother. We rode through Martinsville, Blacksburg and out old route 60 to Charleston, WV. The same route I would later follow each week as I drove from Danville to Blacksburg to VPI. Route 6 from Fairystone Park to Christiansburg has lots of curves. This was my first experience with mountain roads and a route that would play a part at the end of our trip. I don’t remember when we camped the first night except that it was a roadside state park and picnic area near Chillicothe, OH; not in a camp ground. We covered about 350 miles the first day out, which was about our daily mileage average. This was also as far as I had ever been away from Danville. Many times on the trip we camped along the side of the highway and never had a problem. I guess things were better then. The second night that we camped was near Kanakee, Illinios. We were now 750 miles from home. From here it was northwest to Davenport and on to Dubuque. At Davenport I saw the Mississippi for the first time. From Dubuque we traveled on the Wisconsin side of the river and stopped for the night at Prairie du Chien. In addition to the ten cent over-charge for coffee I remember Ed asking what kind of ham they had on the menu. The proprietor who was a gruff short fat man became angry and asked “Just how many kinds of damn ham do you think there are?” He had never heard of country ham. From Prairie du Chien we traveled into Minnesota and through Minneapolis and St. Paul. In 1960 there were few interstate roads and we rode through the middle of both cities. From there we traveled northwest and picked up the southeast corner of North Dakota. I don’t remember the route we took but I do remember traveling to Redfield, South Dakota and ending up in southwest South Dakota where we saw the Badlands, The Black Hills, and Mt. Rushmore. While in the area we went to Sturgis and Lead. After leaving South Dakota we traveled west to Gillette, Sheridan and on to Cody, Wyoming. Between Sheridan and Cody, while traveling on what I remember as an unpaved state highway, I ran out of gasoline. Looking at today’s maps I am not sure why we did not purchase gas in Sheridan, but my best guess is that we did not need gas at that time and thought we would find it down the road. After I ran out Ed used a rope to pull me until he ran out of gasoline also. Lynnwood transferred some gasoline from his tank to Ed and then left me while they rode to the next town to purchase fuel. The “165” had a divider in the middle of the tank that prevented all of the fuel from draining out of the tank. While they were gone I laid the bike down on the side and the little remaining fuel in the tank allowed me to start the engine and travel a few more miles until I met the other two coming back for me with fuel. Yellowstone National Park made a big impression on me as it had on each of the other three times I have been there. I remember our first night in the park; we looked for a camp ground only to find that the camp ground we chose was still not opened for the year because of snow still on the ground from the heavy snow from the winter. In the next camp ground we camped beside another motorcycle camper, the only other motorcycle camper I remember seeing on the whole trip. The next morning we were awakened by a park ranger who was hooking a bear trap to his pickup truck. The trap had a full grown bear in it. As I recall we saw thirty some bear while in the park. Yellowstone was where gasoline was too expensive at 39 cents a gallon. Leaving Yellowstone through the north gate into Montana we traveled to Butte and Missoula on a road that today has been replaced by Interstate 90. The mountains are so rough and high I guess they just widened the old road into an interstate. I remember really liking the scenery in Montana and Idaho. It was also in this part of the country that the Rocky Mountains presented their greatness challenge to our little six horsepower motorcycles. I can remember riding many miles up the mountain in second gear, and at times in first gear. How these little motors stood up to this daily grind is still amazing to me. I guess the design which was an adaptation of the German DKW motorcycles whose engineering designs were forfeited to the Allies as a part of War Reparations at the conclusion of World War II was a good design. Did my father fly missions over Germany in a B-17 so I could ride an American Harley-Davidson motorcycle that was designed by Germans? Not really! As I look at today’s maps, I can’t remember if we left Missoula and went to Coeur d’ Alene or if we went down to Lewiston, Idaho. From an old map I might be able to tell, but the roads have changed. In any case we ended up in Richland, Washington and the headwaters of the Columbia River. The real shock to me was the desert land in Washington State. All farmland was irrigated and the rest was dry desert. The trip down the Columbia River Gorge was great. We camped in the gorge at The Dallas. The camp was in a roadside overlook where we slept between picnic tables that we tied the tent to. Early in the morning we were awakened by a man collecting cans. Not for the aluminum but for the five cent litter deposit that Washington and Oregon had on cans. That morning we rode through Portland and down to the coast where I saw the Pacific Ocean for the first time at Otis, Oregon. From Otis to San Francisco down highway route 101 paralleled the coast for 650 miles. I think I have seen more of the Pacific coast line then the Atlantic. We arrived in San Francisco in the early afternoon crossing the Golden Gate Bridge, riding by Fisherman’s Wharf, up Telegraph Hill where we could see most of the city. I remember the streets being so steep that we stopped and discussed if we could get up them. While there we rode down Lombard Street which is famous as the crookedest street in the world. While standing on Telegraph Hill we discussed wanting to see Reno at night as it is famous for its lights. The distance to Reno is 200 miles. We left San Francisco about 3 PM and rode through Sacramento and up the Sierra mountains on which the Donner Party froze to death. So did we. As we topped the area around Donner Pass, at an altitude of about 7,000 feet, the temperate dropped to near freezing. We stopped and put socks on our hands. Today I can not think why none of us wore gloves on the trip. I didn’t even have a pair with me and I can not remember considering purchasing a pair, even though my hand cracked open and bled during the trip. Back then there was no product such as sunscreen. When we crossed the desert near the Great Salt Lake we tied handkerchiefs over our faces as we were badly burned. We reached Reno at about 3:00 am in the morning. We entered the bus station to get coffee. While there we asked a policeman where we could camp for the night. His reply was that people did not come to Reno to camp and there were no camp grounds near by. He then told us to go the city park where we could camp. He would tell his fellow policemen to watch out for us. We pitched our tent and had a good night’s sleep. After leaving Reno we crossed Nevada to arrive at Wendover in mid afternoon. We stopped in a store for a drink and found a thermometer that showed 110 degrees in the shade. As we left Wendover and passed the Bonneville Salt Flats I was able to turn the ignition off on the bike but the motor was so hot it keep running without the ignition being turned on. HOT! We rode through Salt Lake City, Utah and on to Vernal, Utah where, after arriving after dark, we camped for the night in Dinosaur National Park. From Vernal we rode to Denver. Our stop in Denver was for two reasons. Ed was a member of the Shriners and there was a National Convention in town, and we also had a friend who was a former member of the Seminole Motorcycle Club who was in the Air Force at Lowry Air Force Base. After watching the Shriners parade we went to Lowry and found Wade. He was in charge of the barracks and offered to allow us to sleep in a bed and have a hot shower. I, being young, was upset at the idea and felt that we might get in trouble. We left only to sleep under a highway advertising sign outside of town. The trip was uneventful until about the middle of Kansas. I began to feel that my motor was not running well. We found that the crankshaft bearing on the right-hand side of the motor was failing. We found a small Harley-Davidson shop in St. Joseph, Missouri. The shop, in the back of a small grocery store, had the necessary parts and loaned Ed the tools with which he replaced the bearing. In fact, the man was so happy to learn how to replace the bearing without taking the motor out and splitting the cases he had his wife feed us lunch. The repair worked well but caused problems that would show up in Kentucky. From St. Joseph we rode to Hannibal, Missouri. We had taken turns calling home about every few days and we rotated calling. Each family would then share the travel news. I remember Hannibal because when asked where we were, my reply was that I was “in Mark Twain Land”. I am not sure of the route from Hannibal, but by some route we ended up in Louisville, Kentucky. In Louisville we slept in a roadside park. This park was below road level and had a set of stone steps that we rode down to get to the park. The next morning we rode the bikes up the steps and set out for Danville. Somewhere, as we traveled though West Virginia, we came upon a road crew putting down new asphalt paving. As we rode on the new pavement a fast rain shower came up. With the rain and oil from the new road surface the roadway became very slick. Ed and I got slowed down but Lynnwood, who had been riding the curves too fast, slid and fell on the new surface. He had several skinned places on his arm and leg and bent his bike enough that it did not want to run straight and true. He was somewhat uncomfortable after that. We came back in through Blacksburg and made it to Floyd, VA just before dark. We had decided that we should eat supper in Floyd and ride on in to Danville even if we would get home late at night. One reason for this was Ed had received word that his mother had become very ill and felt he should try to get home that night. After supper as I started the bike I found that the battery was so weak that it would not keep the motor running if the headlight was on. Back then we did not ride with the headlight on except after dark and in the early morning. Not having a headlight we discussed camping and riding in the next morning, but Ed wanted to get home. We suggested that he go on but he felt we should finish the trip together. We then decided for me to ride in the middle with no headlight. So here we were, the bike in front and in back had magneto headlights that dimmed when the motor slowed for the route 6 curves and Ed was leading with only one eye. One minute he was in front and the next he turned with me close on his back fender. Somehow we made it home and arrived in Danville much after midnight after riding over 550 miles - our longest mileage day for the trip. After arriving in Danville we each went home. The next day I found that Ed had gotten home and went in to speak to his mother. Her comment was, “I have been waiting for you son”. Ed left her room to take a shower. After his shower he returned to her room to find that she had died. Upon my arrival home I was greeted and then told to get in the shower. After all, we had been 21 days camping. From time to time we showered in camp grounds and even one time we bathed in a creek beside the rode. I needed a shower. After Ed’s mother’s funeral, Ed replaced the generator which had been damaged by the bad crankshaft bearing that was replaced in St. Joseph. The following week I rode down to Richmond to visit my grandmother. While there I dated the niece of the farm manager. We went to see ‘Ben Hur’. I had never dated before. My drivers permit was only for motorcycles so we had to have Gordon, her uncle, drive us to the movie. After arriving back in Danville, and after the big first date, I began to get interested in getting an automobile. While I would have liked to have kept the bike, it was necessary to trade the bike in on the car. Sometime in the fall, or early winter of 1960, I got my automobile drivers license and began to drive a 1949 Willis Jeepster. 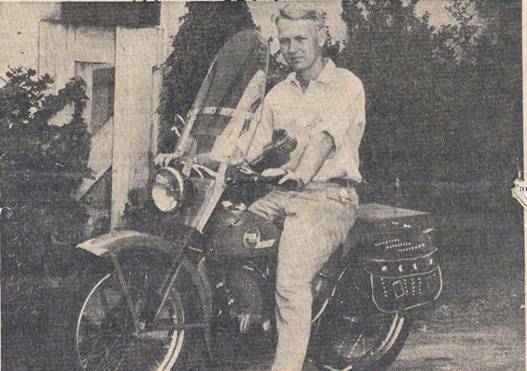 Sometime during 1961 I borrowed Lynnwood’s motorcycle for a short ride. While at his home I met his daughter and we took a short ride on the bike. Although I had been dating a girl in my high school class during the summer of 1961, I one day stopped by Lynnwood’s and found his daughter Pam in the front yard. I asked her for a date, only to find that their Pentecostal religion would not allow attending movies. We went bowling. I fell hard for her. That relationship lasted until 1965. During 1961-1965 my friend HT and I built mini bikes. At that time mini bikes were not common in Danville. We raced these mini bikes and had great fun. In 1965 I purchased a 1957 Harley-Davidson Sportster. I then traded for a 1965 Harley-Davidson Sprint. The Sprint was fun as I had gotten into trials riding. Although this bike was best for off-road I did take several trips to Richmond and Tennessee on it. In 1966 I sold this bike and did not ride again until 1989. After campers, boats, and motor homes, in 1989 I purchased a 1983 Yamaha Venture. Then, in 1990 another Venture, and in 1993 a third Venture. I now ride a 2001 Honda Goldwing. Since getting back into riding I have logged over 250,000 miles with 15 trips to Daytona Beach Bike Week.